Beloved husband, father, grandfather, great-grandfather and brother passed away Tuesday, February 7, 2017 at St. Francis Nursing Home. Age 86 years. Son of the late Arthur and Alice (Singer) Henris, Howard was born September 11, 1930 in Flint, Michigan. He married Rosemary Ann Kretz, his loving wife of 64 years, on September 13, 1952. After graduating from Holy Family High School he attended General Motors Institute in Flint, Michigan. Howard worked for General Motors in Data Processing, starting at Central Foundry Division, then Saginaw Steering Gear Division and EDS. After retiring in 1989 he moved to Sanford Lake, Michigan, where he enjoyed summer weekends with his family on his pontoon boat. Howard also enjoyed spending winters in Arizona, golfing, occasional trips to Las Vegas and the Michigan casinos, but most of all playing with his grandchildren. 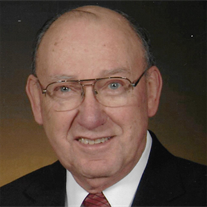 Howard was a member of the Catholic faith, and was a past member of St. Thomas Aquinas Church, Saginaw, St. Agnes Church in Sanford, and currently Holy Spirit Church in Saginaw. He was an usher, lector, member of the parish council and member of the Knights of Columbus. Surviving besides his wife Rosemary are three sons and three daughters, Jim (Denise) Henris, Saginaw; Kathy (Paul) Duff, Waterford, MI; Larry (Kathy) Henris, Saginaw; Dan (Lori) Henris, Saginaw; Cheryl (Jim) McGettrick, Warsaw, IN; and Julie (Ken) Slesarik, Peoria, AZ; fifteen grandchildren, Amy, Jim, Misty, Michael, Kelly, Kyle, Ryan, Haley, Amanda, Trevor, Tyler, Shaun, Caitlin, Derek, and Justin; also six great-grandchildren, Ashlyn, Jaden, Brooklyn, Tegan, Quinn, and Hudson; one brother Art Henris, Rantoul, IL; many nieces, nephews, cousins and special friends. Howard was preceded in death by one brother, Robert Henris, one sister and her husband, Sally and Charles LaFountaine, and one sister-in-law, Carol Henris. Funeral Liturgy will take place 10:00 a.m. Friday, February 10, 2017 at Holy Spirit Catholic Church, 1035 N. River Rd., Saginaw. Rev. Fr. Peter Gaspeny and Fr. Dan Fox will officiate with burial in St. Andrew Cemetery. Friends may visit at the Snow Funeral Home, 3775 N. Center Rd. where the family will be present on Thursday from 2:00 p.m. to 8:00 p.m. and on Friday at the church from 9:00 a.m. until time of Mass. The Knights of Columbus Council #4232 will pray the Rosary at 3:00 p.m. Thursday at the funeral home. The family would like to thank St. Francis Home and Heartland Hospice for their care and compassion during Dad’s final days. Those planning an expression of sympathy may wish to consider memorials to the St. Francis Home.